Since the 2008 Global Financial Crisis it's all we can talk about. From the inner workings of investment banks to high-stakes gambling and payday loans, social scientists everywhere are thronging to the topic of how we humans embroil ourselves in financial obligations and turmoil. But is this really a worthy subject? Clearly, the answer is "yes." Money is a fascinating topic to reflect on what it means to be human. Moreover, money matters play an enormously influential role in our personal, familial, and social lives. It can, metaphorically and literally, make or break us. 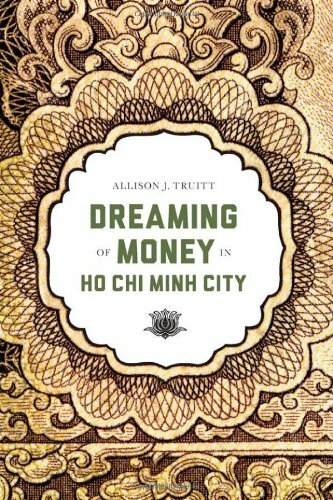 Allison Truitt's book "Dreaming of Money in Ho Chi Minh City" demonstrates how money impacts our lives in ways that are cultural, and personal, as well as economic. Based on ethnographic research between 1997-1007, Truitt describes how different kinds of money are put to work in everyday life among residents of Ho Chi Minh City. The value of the book is that it demonstrates clearly, through ethnographic examples, how money influences us more than we realize. Although all her examples are from Ho Chi Minh City, the "story" is applicable to human beings everywhere. Truitt points out that money isn't easy to study. Unlike traditional anthropological studies, which choose a village or a suburb as their focus, money is impossible to pin down because it is everywhere and constantly in circulation. Because of this, Truitt built relationships with individuals and households, accompanied them as they made transactions, and witnessed their sociocultural lives. She interviewed sellers, buyers, shopkeepers, bankers, and foreign investors. As a result, the book's six chapters cover all kinds of settings and topics, including illegal lotteries, the history of US dollars in Vietnam, counterfeit currencies, gold ships, temples, and real estate. The book's title comes from an association between Ho Chi Minh, money, and an old children's song. Truitt explains that, after 1975, schoolchildren were taught a song called "Last night I dreamt I met Uncle Ho." Ho Chi Minh's portrait is printed onto Vietnamese banknotes, so people associate him with money. To dream of Ho Chi Minh is to therefore dream of money. This folkloric connection between politics and money isn't just an accident. Rather, over the past few decades, rapid changes in currency exchange rates and the circulation of multiple currencies has meant that people in Vietnam have had a heightened awareness of money's volatility. In the 1980s inflation reached above 550%, and in the 1990s the dong was continually devalued against the US dollar, meanng that residents were driven to save and transact in US dollars and gold. This volatility has impacted social and cultural life in Ho Chi Minh City. The juggling of multiple currencies seems like a practical economic challenge, but it affected practices as diverse as playing lotteries and paying homage to ancestors in temples and at graveyards. Truitt explains that money and ritual are not so separate as one might expect; in fact, she says, the Vietnamese attribute a spiritual power to money, saying that "money is a fairy, a god." (5) As such, how money is incorporated into rituals matters. For example, people use fake US dollars as "spirit money" to offer to ancestors and spirit deities. These were almost perfect reproductions, except that the words "United States of America" were replaced by "Bank of Hell." (p.90) Altering the physical form of money changes its purpose from a means of exchanging economic value to a means of exchanging ritual value. In a more mundane example, people's belief that damaged money is of no value affects how it circulates on the street. People are reluctant to accept damaged money for fear that they won't be able to pass it on. This judgement is as much cultural as it is economic, since technically the money is still legal tender and should be accepted anywhere. It demonstrates just how much we ordinary people decide what counts as money and what does not. "Dreaming of Money in Ho Chi Minh City" is a fascinating read, replete with human stories and unexpected insights. It is written with a non-specialist audience in mind, so it is suitable for anyone who has an interest in money, economics, and culture. It occupies a rightful place among the work of anthropologists such as David Graeber or popular economists such as Niall Ferguson or Joseph Stiglitz. In fact, one could view it as a kind of economic travel writing that opens up a new way of engaging globally-minded citizens with the countries they visit. I look forward to more books like this being written about other places.